The Kulturkaufhaus Tietz is a cultural centre that is located in the town of Chemnitz. 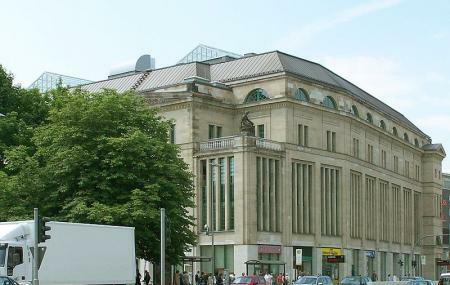 Also called the Cultural Department Store, this place was first built in 1913 by Wilhelm Kreis and was used as a departmental store during the World War 2. After many restorations, today TIETZ is home to the Museum of Natural History Chemnitz, the Chemnitz Public Library, the City Music School Chemnitz, the Volkshochschule Chemnitz, the city archives Chemnitz and the Urban Cultural Management. This centre aims to achieve balance between education, culture and commerce through its many outreach programs. The Kulturkaufhaus Tietz also hosts numerous readings, lectures, concerts, courses, discussions, exhibitions and events. For more timings, visit the museum website. How popular is Kulturkaufhaus Tietz? People normally club together Staatliches Museum Für Archäologie Chemnitz and Roter Turm while planning their visit to Kulturkaufhaus Tietz.